Upon entering the predrilled hole, the first tooth (broaching tooth) of each flute produces a groove. The helical infeed into the pre-drilled tap hole moves the Punch Tap to the application depth. 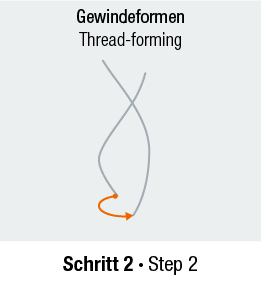 This first process step does not yet produce a thread. Once the Punch Tap has reached its depth of application, the cold-forming of thread starts. This is achieved with a synchronous movement of feed and rotation. The thread is produced with a half left-turn in the pitch. 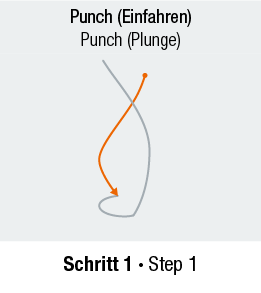 Each tooth of the Punch Tap produces half a thread (approx. 180°). 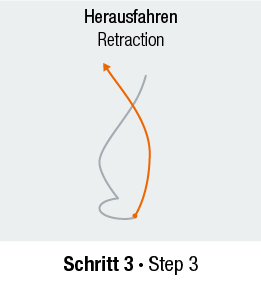 After the threads have been formed, the Punch Tap is retracted in a helical movement from the bore hole using the path of the produced grooves. 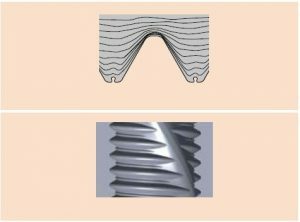 The finished cold-formed thread is interrupted by two helical grooves offset-by 180°. From a depth of thread of 2xD, the static strength is not adversely affected.